Photo of the day: “Roasted chicken” @ Quan Pho Ngon – Com Rang Ga. Photo credits: Aaron. We are definitely feeling the effects of being here during the Tet holidays today. We made sure to ask the front desk about which attractions are still open over the next few days, so we can plan accordingly. After having a simple breakfast at the hotel, we were off! 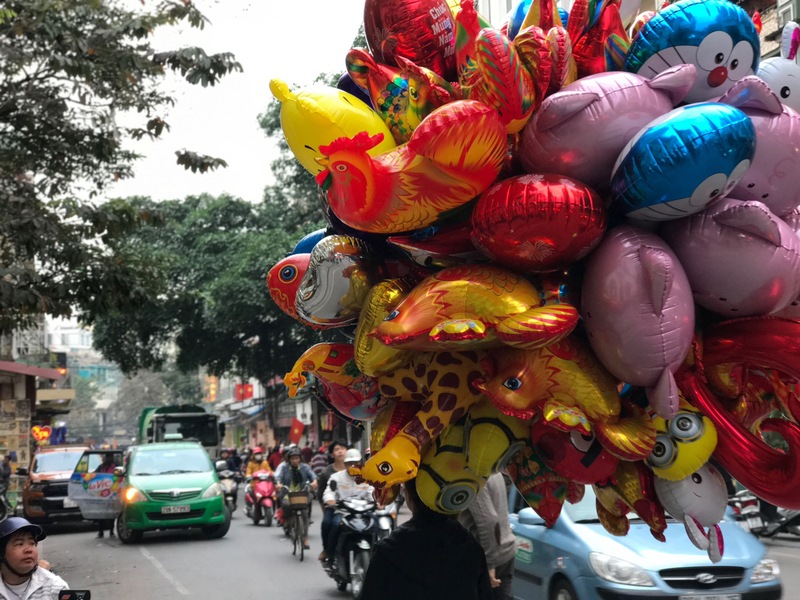 Festive balloons in time for the Tet holidays. Photo credits: Aaron. Aaron grabbed a coffee and got some work done at La Place Cafe, while I went to get my nails done. Based on my online research, Orchid Spa is the best nails salon in town. I was very disappointed to see the sign outside its storefront saying “closed for the Tet holidays”. So, I went to join Aaron at La Place and enjoyed a refreshing glass ofjasmine calamasi iced tea, while doing some more research. Apparently, there was another nails place nearby, which was quite popular, so off I went again, on a mission to get pretty nails. It was a quaint shop in an alley with a room full of customers getting their nails done, so I knew I was in the right place. There was a language barrier but I managed to get across I wanted a pedicure. After ~40minutes of soaking, snipping, polishing and even a free foot massage (which actually really hurt at times), my mission was accomplished! Pretty good for ~ $5 CAD. Feeling happy about how my nails looked with sandals now, it was time to satisfy my hunger. We wanted to go check out the Vietnamese Women’s Museum, and I found a good Bun Bo Hue place nearby. Unfortunately, we saw the dreaded closed storefront again. Disappointed, we started frantically doing searches on our phones. I decided to just open up Google mMps and click on nearby restaurants and found one with a picture of a huge chicken leg on a bed of fried rice. It did not even exist on Foursquare but we wanted to check it out anyway. As soon as we turned the corner, we saw a very busy food stall with plates of roasted chicken legs in front of a flaming wok. 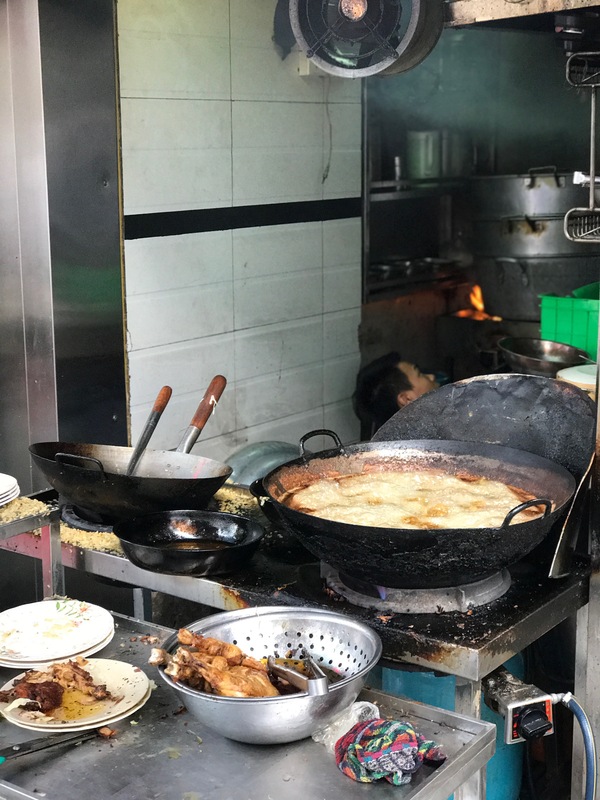 In front of this open kitchen was a sidewalk full of people sitting on colourful plastic stools enjoying plates of fried rice with roasted chicken. We were both immediately sold and ran across the street towards this amazing sight. One thing I love about the service in Vietnam is, there may appear to be no seating, but they will almost definitely create seating for you. We quickly sat down and ordered 2 plates of their special “roasted chicken” with fried rice. Aaron also ordered some soy milk to go with his meal. He really enjoyed this and thought it was the “real stuff” since he he can taste the bits of soy bean in it. But we must get back to the main dish! 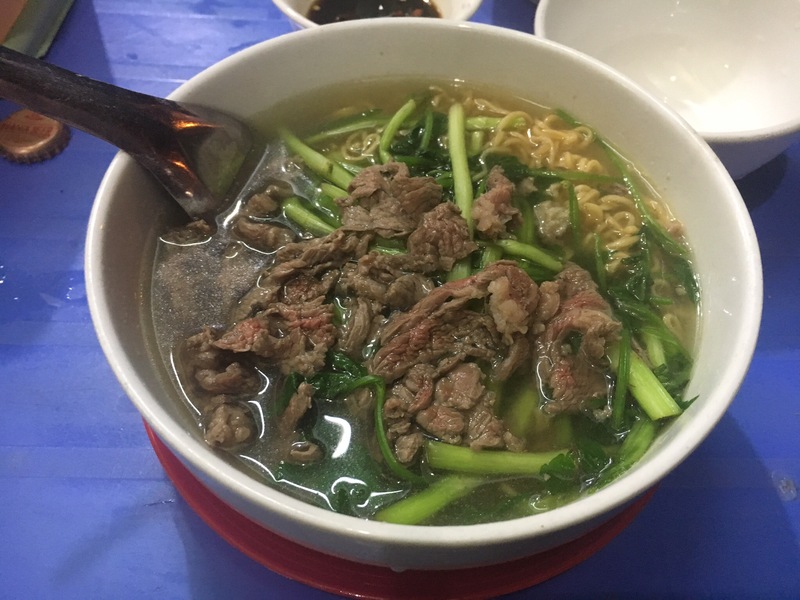 Similar to when we had Com Ga in Hoi An, we started with some soup, full of flavour and herbs. Then came the chicken rice. It was an amazing sight. A huge roasted chicken leg on top of a bed of tasty rice. The chicken leg was already delicious, but you also have that option to dip it in an interesting “salsa” they’ve prepared. In the “salsa”, was likely tomatoes, lots of spices and perhaps chicken sauce? We were both super excited about our random food find and talked about how this is better than any museums or attractions we can visit. 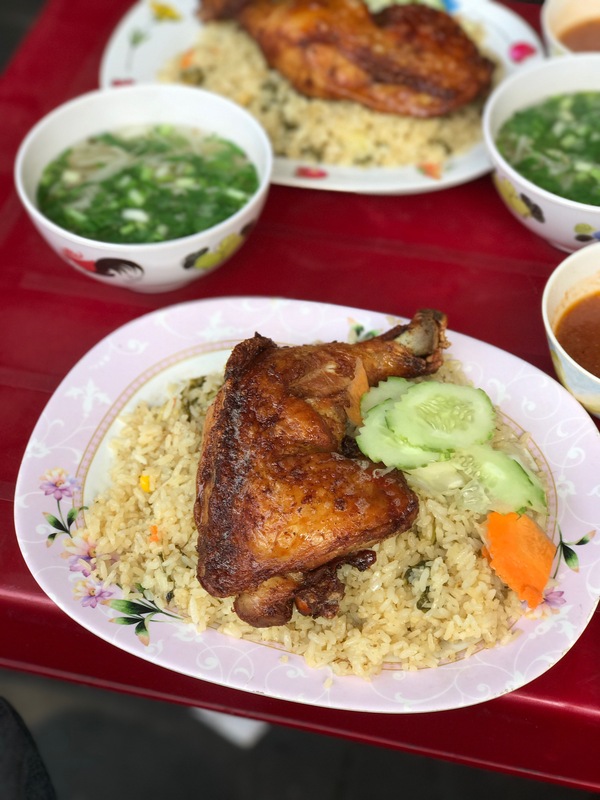 “Roasted chicken fried rice” @ Quan Pho Ngon – Com Rang Ga. Photo credits: Aaron. Roasted chicken or deep fried chicken? It doesn’t matter. It tasted amazing! Photo credits: Aaron. We inhaled our meals and headed down the block to the Women’s Museum. Interestingly, Aaron was the one who really wanted to check out this museum. It is one of the higher rated attractions of Hanoi, so I agreed. Plus, I told myself that I should probably do at least one touristy thing a day. As a non-museum fan, there were some interesting bits in there, especially about wedding rituals and also child birth traditions. The building itself was very modern and nicely laid out. We were in a post-massage daze so we decided to go home and rest for a bit. I decided to complete a bunch of reviews on TripAdvisor that I promised to do for various establishments. Aaron has been wanting to try the local draught beer (Bia Hoi) since we got to Vietnam, so we decided tonight was the night. I read that they started at 5pm, then would sold out before the end of the evening, so we decided to go for a pre-dinner drink. 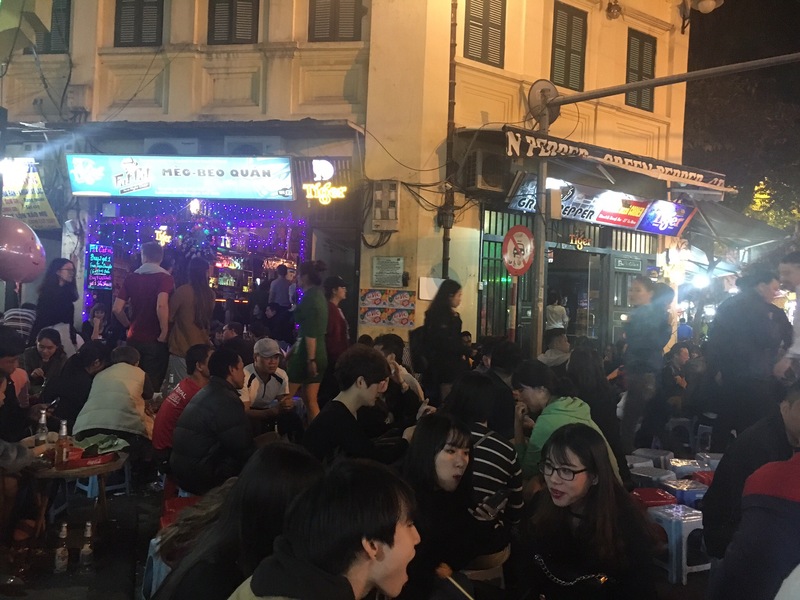 We walked to the “Bia Hoi Corner”, where a lot of tourists hang out to enjoy cheap beer. It was quite the sight with many people sitting on little plastic stools, just enjoying some beer with friends. Traditionally, this was an activity for males to bond with their buddies but now, some women go as well. 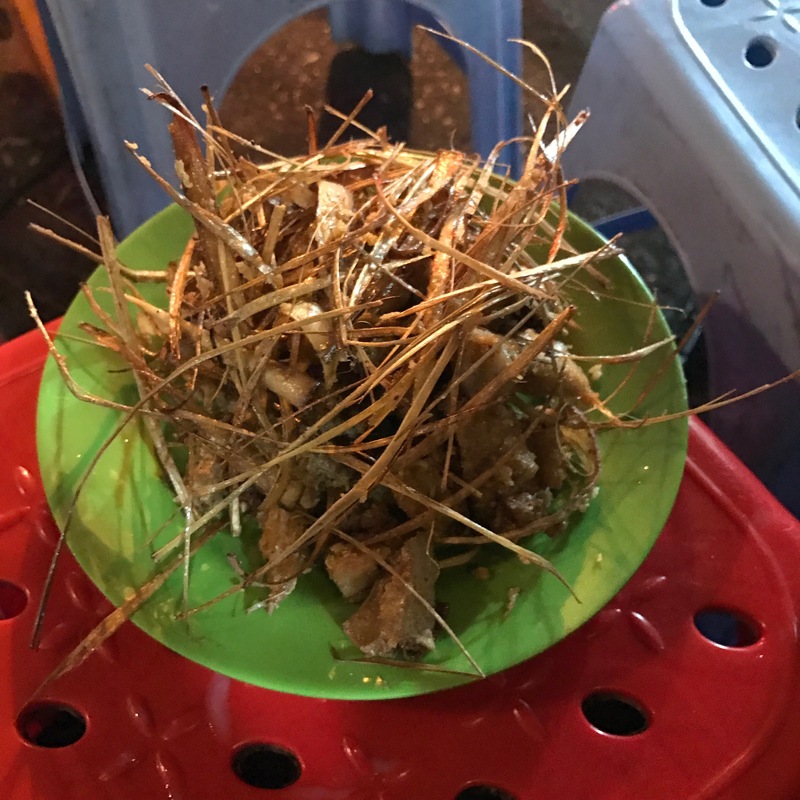 Unfortunately, after asking a few of the vendors for Bia Hoi, we found out they were all out, so we just sat down anyway and enjoyed some Hanoi beer with a side of deep fried chicken cartilage, as traditionally, you should always have some deep fried snacks with your Bia Hoi. Then let the people watching begin! There was an interesting point of the night when the police came and the owners frantically started stacking up the unused stools and pushed them to the side. I guess they were not supposed to take up so much of the road. I found a good fried Cha Ca (fried fish) place, so off we went to get some dinner. On the way there, I saw a mother carrying her daughter over a gutter, possibly trying to get her to defecate? I was not sure. I just saw the baby girl was bottomless and the mother was mumbling some soothing words to her. One more time, we were faced with the discouraging “closed for the Tet holiday” sign. We settled on a restaurant called Bia Hoi Ha Noi. Contrary to their name, they did not have any Bia Hoi. They had a very large menu with a bunch of random dishes – which is always a bad sign. The place was busy and full of locals so it couldn’t be that bad right? The owner was staring at us and the menu and started pointed at the most expensive dishes on the menu. We did not take her advice and just ordered some morning glory with a beef noodle bowl. Of course, we ordered some more Hanoi beer because apparently, that’s what you do here. The table next to us of a few men, had a whole crate of Saigon beers to go through! The food here was ok. The morning glory was a little over cooked and the noodle had some weird bitter-tasting vegetable in it. The noodle itself was like instant noodles. I was quite disappointed but reminded myself that I cannot always expect to have amazing food finds like the one we had this afternoon. We headed home and decided to start making a dent on the tropical fruits that are provided to us daily by the hotel, which we never had the chance to eat yet. We had the mango and it was sweet but also had an interesting salty flavour to it. Today was the 28th day of December according to the lunar calendar. This is the day to doing some spring cleaning to wash away the bad luck from the previous year and we saw a lot of that today with vendors cleaning out their stores. It also marks the beginning of when a lot of businesses will take some time off for the year. It was nice to see that these hardworking folks are actually taking some time off to spend with their families. I guess the next couple of days will be quiet for us as the city slows down.